The aliens of Planet K remain on a mission to discover galaxies! Countless galaxies are scattered throughout our observable Universe, each a glorious system that might contain billions of stars. Our aim is to explore them and share our love for techno music while we do so. We have already checked-in at many planets, but our favorite one is – and ever will be – the fascinating blue marble. To unlock the history of this sphere, we will have to learn about the compositions and motions of stars in each region. 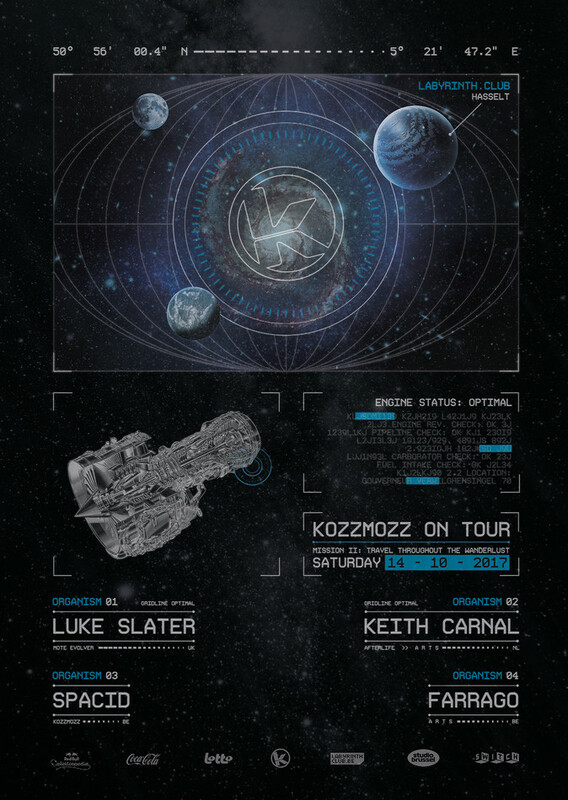 That is why the second stop on our blue marble tour will be: LABYRINTH CLUB. The surroundings of this black hole look very promising. We are certain all inhabitants of planet earth will love it. We are thrilled about this new mission and travelling at the speed of light to get there as fast as possible. So look up at the sky. We will emerge out of the Milky Way on Saturday, October 14. We are getting closer… Humans. We are getting closer… . And as usual, we are bringing some of our favorite space commanders with us. Luke Slater is a rare phenomenon in electronic music: he is someone who has helped define and redefine the techno genre throughout a number of decades. Starting out in the ‘90s, twenty years later it is no exaggeration to say he is as relevant and exciting as ever before. His gig schedule and discography stand as proud testament to that. Meanwhile, the music he releases under a number of respected guises is just as critically acclaimed, mainly releasing his music these days on the Berlin label Ostgut Ton and his own Mote-Evolver. It all started in the nineties with four landmark albums as Planetary Assault Systems on Peacefrog and NovaMute. After a period away from the spotlight, 2009 saw Slater return right to the vanguard with the ‘Temporary Suspension’ album on Ostgut Ton, the most influential label of the day. The record heralded a return - for Slater and the wider scene - to some of the traditional, purist values of early techno. Consider it with follow-up ‘’The Messenger’ on the same label and you have two of the finest electronic albums of recent years: they combine moments of serenity with frictionless grooves and more brutalist workouts that always supersede the usual ‘techno tool’ blueprint. As well as continuing to influence modern techno with the music he chooses to release on Mote-Evolver, Slater has also recorded standout ambient albums, tracks and EPs as 7th Plain. They elegantly combined ballet with techno on labels like Ostgut Ton and prove the man’s musical momentum is, if anything, picking up pace. Especially when you add into the mix his Ostgut Ton affiliated L.B. Dub Corp project, with which he has explored classic techno, introspective moods and the sounds of his roots. Spacid has a colorful 26 years of dj-ing experience. And it shows! Spacid played at an impressive amount of clubs, parties and festivals in and out of the country. He understands how to adapt a range of atmospheres depending on the venue, people and mood. And all this without ever renouncing his roots and musical beliefs. Both his reverence for the past and his quest for innovation transpire in his work as a dj. His thirst for renewal is illuminated by his passion for music, which keeps him sharp. He’s been a Kozzmozz resident for many years and knows the crowd like no other. Farrago surfaces as a new name in the Belgian techno scene albeit with a familiar face. In 2013 Sam Deliaert formerly known as Talbot Wood was picked up by Other Heights and Curle Recordings. The name change is motivated by the meaning of the word itself. Farrago, literally 'a perplexing mixture', is the alignment and legacy of his earlier work merged with new ideas and recent development. It's the perfect marriage between body and soul. Meanwhile some of the more captivating patterns and synthesis from his other Elektron unit, the Analog Four, have already found their way through a recording device. This preceded a connection with ARTS, a young but already quite established Berlin based techno label. His latest endeavor on the label, the ‘Weight of the Land’ EP is a collaboration with Amelie Lens. We are convinced that these experienced and well equipped explorers will uncover the brightest and darkest corners of our latest mission: join us to Labyrinth club!